Was looking at a weird what-looks-like-a-memleak issue somewhere in the system on changing desktop background (somewhat surprisingly complex operation btw) and wanted to get a nice graph of "last 30s of free -m output", with some labels and easy access to data. A simple enough task for gnuplot, but resulting in a somewhat complicated solution, as neither "free" nor gnuplot are perfect tools for the job. exports="total used free shared available"
That might be more awk than one ever wants to see, but I imagine there'd be not too much space to wiggle around it, as gnuplot is also somewhat picky in its input (either that or you can write same scripts there). I thought that visualizing "live" stream of data/measurements would be kinda typical task for any graphing/visualization solution, but meh, apparently not so much for gnuplot, as I haven't found better way to do it than "reread" command. To be fair, that command seem to do what I want, just not in a much obvious way, seamlessly updating output in the same single window. Next surprising quirk was "how to plot only last 30 points from big file", as it seem be all-or-nothing with gnuplot, and googling around, only found that people do it via the usual "tail" before the plotting. Whatever, added that "tail" hack right to the awk script (as seen above), need column headers there anyway. How much available memory was there at the start of the graph. How much of it is at the end. Min for that parameter on the graph. stats won't give first/last values apparently, unless I missed those in the PDF (only available format for up-to-date docs, le sigh), so one solution I came up with is to do a dry-run plot command with set terminal unknown and "grab first value" / "grab last value" functions to "plot". Which is not really a huge deal, as it's just a preprocessed batch of 30 points, not a huge array of data. Probably the most complex gnuplot script I composed to date. Yeah, maybe I should've just googled around for an app that does same thing, though I like how this lore potentially gives ability to plot whatever other stuff in a similar fashion. 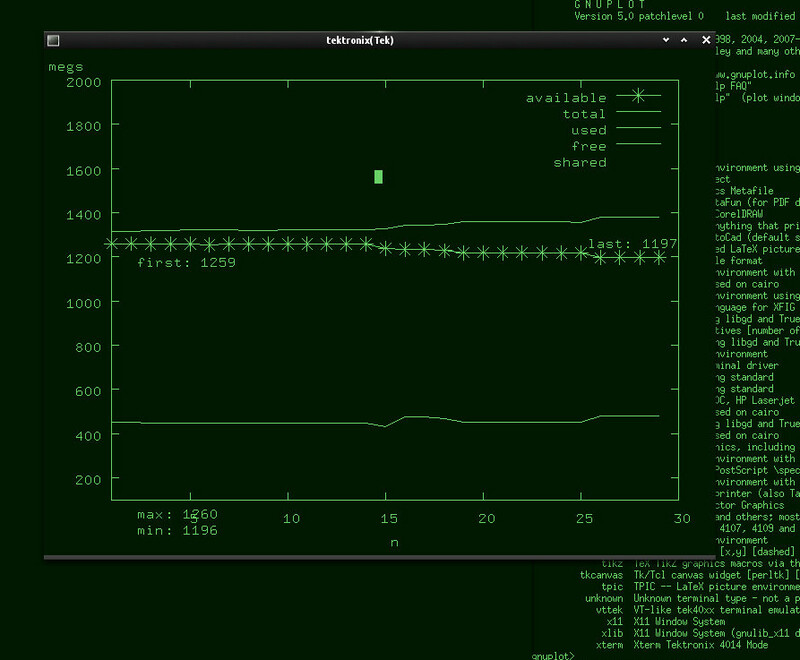 That, and I love all the weird stuff gnuplot can do. 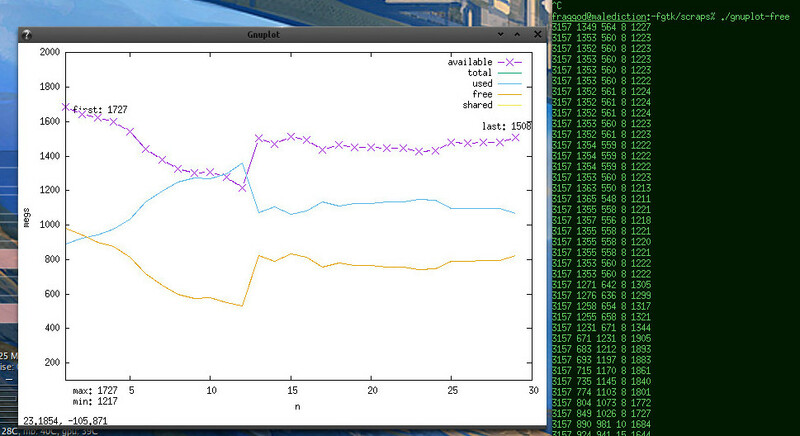 And there's also the famous "dumb" terminal for pseudographics too. It updates smoothly, with line crawling left-to-right from the start and then neatly flowing through. There's a lot of styling one can do to make it prettier, but I think I've spent enough time on such a trivial thing. Full "free | awk | gnuplot" script is here on github.